Garlic: How to Harvest a Year-Long Supply | Gardens Alive! Mike and his You Bet Your Garden producer Alexis Landis have a seasonal conversation…. Q: I love your show and listen religiously. You've done such a good job teaching me how to grow garlic that I harvest a hundred or so nice sized heads every year! My problem is that I can never get them to last; the heads get dried out after about four months. Is there a way to make the garlic I'll soon harvest last until next summer?" Alexis: Mike—before you get to his specific question, why don't you quickly review how and when to harvest garlic. This is the time of year—early July—when it's getting ready, right? Mike: Absolutely, Alexis. I tend to think of the Fourth of July as a good time for me not to be away because that's when my garlic typically comes in. But the exact timing depends on a lot of factors—your USDA growing zone, raised beds vs. flat ground, the amount of sun and rain you've had…. A: So—is there a secret harvest 'clue'? Or do you need X-Ray vision? M: Ha! I feel lucky if regular vision is one of my superpowers some days. Here's the progression of garlic growing: You plant individual cloves in the Fall, right around the start of the school year. Then the following Spring, if you planted the type of garlic that produces a seed head, you cut and use those 'scapes' as soon as they appear. A: I love when you bring in your extras to share—we stir fry them up with our dinner that night! A: Just the bottom leaves? M: Yes—if you wait until all the above ground growth is brown, the wrappers will split open and the harvest will be ruined. Pick a plant that's still green on top, but whose bottom third is brown and check the bulb. If it's nice and fat and full with a good solid wrapper, start harvesting. A: What if it looks like a big leek or the head seems small? M: Then you wash that one off, use it to flavor a meal—all parts of the garlic plant are tasty and edible—wait a few more days and test another plant. When you decide its ready, pull up all the plants and air dry them in a cool, breezy spot out of direct sun for at least a week, then brush the dirt off and examine the harvest. M: No—that would only further shorten the storage life. Just gently brush them dry, use any damaged ones right away and hang the rest in a cool, dry, airy place indoors. A: But is Michael correct that they won't last long, even if kept cool and dry? M: Yes, if you only grow what are called hardneck varieties—the ones that produce the scapes in the Spring. 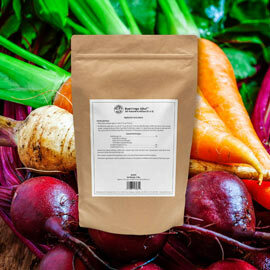 They have great flavor, colorful wrappers and there are lots of different kinds—including wonderful heirloom varieties. 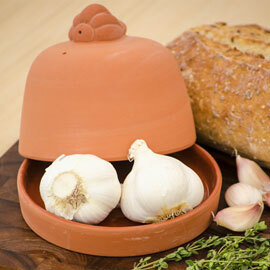 But hardneck garlic doesn't store well; the cloves begin to sprout or go bad about four months after harvest. "Softneck varieties"—often called 'white garlic' or 'California Garlic'—is less diverse, less colorful and, for my money, less flavorful. But softneck garlic will keep for up to a year, so if you really want home grown garlic in March, grow some softnecks for storage when you put your new crop in the ground this Fall. A: But you don't; you preserve part of your harvest by making lots of garlic powder, right? M: Yup. First I sort out and save the biggest cloves for replanting. Then I slice up the rest, dry them in a food dehydrator and put the completely dry chunks into sealed jars with those desiccating pouches that come packed with things like vitamins and new shoes. Then I grind the chunks into fresh garlic powder as needed—like with coffee beans. M: Right—when I make up big batches of garlic powder to give as gifts. A: GREAT gifts; it's so much more flavorful than what you can get in the store! M: That was subtle. As was the fact that you just handed me the empty jar from last Christmas. A: I just wanted to make sure you have enough jars! Anyway, Michael also wrote that he already knew about your garlic powder recipe—which we'll put a link to with this Gardens Alive Question of the Week—but wanted to know what you thought about some other preservation ideas he found online. M: I took a look at those ideas and I find them all to be problematic. Either you're trying to preserve cloves in oil—which can be really dangerous, food poisoning wise—or you're grinding and freezing, which is going to cost you a lot of flavor. I'm convinced that garlic powder is the way to go—it really preserves that perfect fresh-garlic flavor, and it's easy to use; just sprinkle it right onto your pizza or pasta. Or something I do when I have a lot—use it to really coat the outside of a steak and/or zucchini or other summer squash sliced in half down the middle and grill them up. Yum! A: And home-made garlic powder makes a great gift!